Image caption The service has been run since 1964 but will end on 1 November. 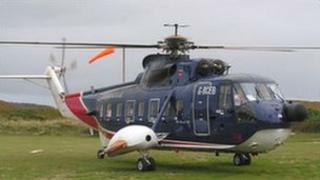 A helicopter service from Cornwall to the Isles of Scilly is to end, its operators have announced. British International Helicopters (BIH) is to end its service from Penzance, which has run since 1964, in November. The company blamed the decision on uncertainty created by legal challenges to its sale of land to supermarket giant Sainsbury's. St Ives' Liberal Democrat MP Andrew George has called the announcement "appalling" and a "disaster". BIH has to move from its 15-acre site at the end of October because of the Sainsbury's deal. It planned to use the proceeds from the sale to buy new aircraft and bid for new business. But the company, which has not operated services this week, said the decision to close the route was "finally triggered by legal action taken by Tesco and two private individuals". No surprise that this has rattled an island community that already feels itself to be stuck out on a limb. The helicopters take about a third of the passengers that go to and fro each year. Aeroplanes owned by the Steamship Group also operate, but BIH's helicopters carry more passengers. And the islands' ferry route doesn't operate in the winter. But there's some reassurance: the Steamship Group says it has plenty of spare capacity for now, especially in the winter when its aeroplanes are less busy. And it's extending the life of the current Scillonian ferry "until at least 2018". Two crunch questions remain for now. - What'll happen to prices under a Steamship air and sea monopoly? - And, in a few years, what replaces the Scillonian and its current ancient port facility in Penzance? It's a lot of uncertainty for a small community to shoulder. It said potential delays caused by the challenges "created too many uncertainties for the passenger service to continue". BIH said the closure would affect employees and that a formal redundancy consultation process had begun with staff. The independent Cornwall councillor for Porthleven and Helston South, Andrew Wallis, said BIH's decision was a "kick in the teeth" for the communities of the islands and west Cornwall. He said: "To me, this is two supermarkets squabbling over a piece of land and the communities of Penzance and the Isles of Scilly are the ones to miss out." Mr George said he had called for an emergency meeting over the link. Conservative-Independent led Cornwall Council said it was "extremely disappointed" by the decision to end the service, which has offered as many as 40 flights a day and is thought to be used by up to 130,000 people a year. It said: "We are keen to continue to talk to BIH about the future of the helicopter service and to see what support can be provided." The Isles of Scilly Council said it was "deeply saddened" at the move. The unitary authority said it was pleased services would operate until the end of October because it "ensures there will be no disruption to the holiday season". It added that its immediate priority was to "ensure the stability of our transport infrastructure" and that "steps are already under way" to do so. The Isles of Scilly are an archipelago of about 150 islands and rocks some 28 miles (45km) south-west of Cornwall with a population of about 2,200. The Scillonian ferry service to the islands from Penzance remains, as do Skybus aeroplane services from Bristol, Exeter, Land's End, Newquay and Southampton. Both are operated by the Isles of Scilly Steamship Group. Group chairman Andrew May said the company would work with the Scillonian community in an attempt to compensate for BIH's pulling out. Sainsbury's said it was still committed to bringing a store to Penzance. BIH said anyone with a flight booked after 1 November would be given a full refund. A helicopter on the route suffered a fatal crash in July 1983. Twenty people were killed when the aircraft, en route from Penzance, crashed in thick fog off St Mary's. Four passengers, including two children, and two crew members survived.